On 10 December the World Human Rights Day is celebrated, convened by the UN to commemorate the proclamation of the universal declaration of human rights by the UN General Assembly in 1948 . This Day is one of the most important events in the UN calendar and is honored with conferences and cultural events such as exhibitions and concerts. In addition, on 10 December the two most important awards in the field of human rights are traditionally attributed: the five-year award of the United Nations for human rights, awarded in New York, and the Nobel Peace Prize in Oslo. 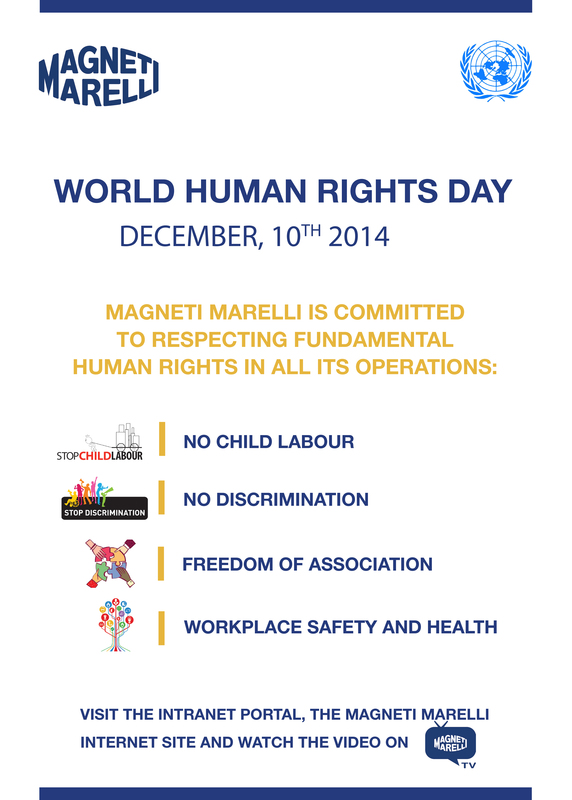 As an activity in the corporate sustainability program, Magneti Marelli is also joining the celebrations of the day through internal communication activities, such as posters located in all worldwide locations, news on the intranet portal and a celebration video on internal corporate TV. In doing so, the company is confirming its commitment to the promotion and protection of human rights, such as the rejection of forced child labor and discrimination, the recognition of the right to freedom of association and the protection of health and safety in the workplace. These principles are consistent with the spirit of the Universal Declaration of human rights, the OECD Guidelines for multinational enterprises and the Declaration on fundamental principles and rights at work of the ILO. To find out more about Magneti Marelli’s sustainability commitment, read Start.